Yasin Arafat, the central president of Bangladesh Islami Chhatra shibir, said that the illegal government is clinging to the neck of the people like a cursed stone. The people of the country are fed up at the excessive actions of the government and their adopted terrorist minions. The government is not only harassing the opposition, but also created unstable conditions in the country by arresting ordinary people and students. In fact, the people of the country have become hostage to the undemocratic behavior of the illegal government. 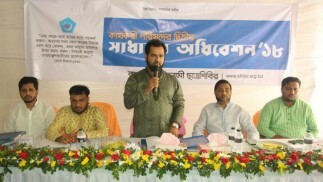 Yasin Arafat, the central president of Bangladesh Islami Chhatra Shibir, said that anti-Islamic evil forces have become alarmed at the continuous advancements of Shibir. There are continuous conspiracies in the country and abroad against Chhatra Shibir, after killings, torture and propaganda could not stop Shibir from going forward. In this situation, all the designs of the evil powers will be faced with ideals. Yasin Arafat, the central president of Bangladesh Islami Chhatra Shibir, said that children of different levels of the country, along with street children, are being deprived of their mother tongue and its correct practice, which will not be right for the future of Bangladesh. Deprivation of the children from their mother tongue is unwanted. Effective steps should be taken to teach Bangla language to the street-children and the underpriviliged. 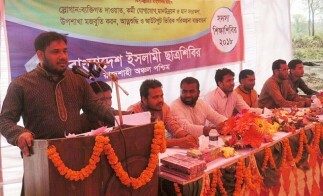 Yasin Arafat, the central president of Bangladesh Islami Chhatra Shibir, urged that the logical demands of the students should be accepted immediately, saying that the young students had come out to the streets for demands that they should have already had by default, which is shameful for the government. Although the students took to the the streets despite the rain, the government did not comply with the demands of the students, wasting time instead. At the same time, the Shipping minister remains in control. The minister must resign immediately and the demands of the students must be accepted to resolve the situation. Yasin Arafat, the central president of Bangladesh Islami Chhatra Shibir, has said that the Qur'an is the guide for mankind. In the light of the Qur'an, people, family and society should be formed. There is no alternative to establishing a Quranic society for the peace of the world and the liberation in the Hereafter. Therefore, the student community will have to play a role to spread the message of the Quran to each house. He said this as the chief guest in a study materials distribution program organised by Dhaka Metropolitan West on the occasion of the International Mother Language Day at an auditorium in the capital. Metropolitan President Abdul Alim presided over the function and the central sports secretary Sarwar Kamal wad the chief guest. Metropolitan secretary Jubair Hossain Rajan and metropolitan leaders were also present at the program.